Regardless of your year, I suspect it was better than this person’s. 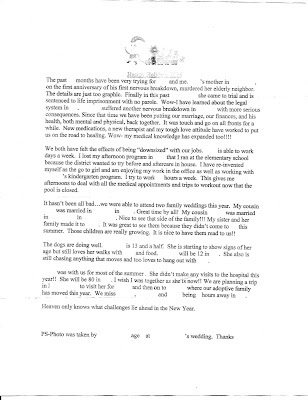 This is a real Christmas-card letter that a friend received from a (very distant, not blood-related) relative. And even if your year wasn’t so good, I hope you had better sense than to do something like this about it. I hope you’re happy and healthy and safe and peaceful, and make lots of wonderful new memories in 2007. And I hope I do, too. Holy frickity frack! I have absolutely nothing to complain about eh?! That is one heck of a Christmas letter.